Although I give you a trailer for an English version, I did watch Spirited Away in the Japanese version—the original version of this film. Spirited Away is a very famous animation film. Like really really famous. If you have known a production company named Studio Ghibli, then you’ll know about Spirited Away. Studio Ghibli is known for its amazing films with amazing stories. My Neighbor Totoro (1988) is one of the most successful films they have and of course, its character, Totoro, has become the icon for the company. Anyway, Spirited Away must not be considered just with one eye, because this film is also seriously famous. I guess it’s no wonder if it’s very famous because the story itself is really really good. This film truly deserved the Academy Awards for Best Animated Feature in 2003 after all. The story of Spirited Away does precede the reputation. It has a simple background story yet very catching. I think this is the first cartoon film that I have ever since besides anime. I found it unusual because I have always watched anime where all the people have their own style of eyes—more of unrealistic eyes. Here, they look mostly like normal, real people do. Though I say the story is good, I still have some questions regarding many things in Spirited Away. Some things are still unanswered to me, therefore, I can’t give 9 stars for this film. However, most of the storylines are actually pretty good. I was just a little kid when I saw this film for the first time, therefore, all the supernatural beings are a bit astonishing and definitely unusual, even though I have watched so many unusual themes of anime. It’s like watching another version of Wonderland, except it is not a wonder, it’s supernatural. And when I watched it again now, I still think all those supernatural looks amazing. Spirited Away really delivered a good story, great animations, and amazing characters. Although Chihiro is the main character, I prefer Haku. I really like the character of Haku. He looks cool no matter how many times I watched it. What I really want more from this film is the relationship between Chihiro and Haku. You will be curious about their relationship. Even though nearly at the end of the film, you’ll get the explanation of their actual relationship, I just wish that I can see more of them. Seriously, Haku is pretty cool. I really wish they had told us about Haku more than they have given to us in the film. There are some mysteries about Haku that I still have questions about. Strange it may be, but Spirited Away is about supernatural beings. You can’t explain it with logic anyway. Everything in it is purely supernatural. How Chihiro can end up in that place is something in magical and supernatural. So, in the matter of the story, I think Spirited Away is unique and superbly good. Spirited Away is definitely one of the finest animated films with its traditional setting. Hayao Miyazaki definitely has gotten many praised from this film and I think he really deserved them. His details in this film are splendid. Every aspect and drawings were drawn thoughtfully. The visual of this film is amazing and beautiful. I think I understand why people love this film very much and why they often give this film a 10. There is so much going on in the film, but somehow, Miyazaki succeeded in the execution. Every detail of the drawing in the animation really had been thought thoroughly. This film, even though it’s an animation, really has beautiful settings. It’s like seeing real places turned into drawings. Though some flaws are still there in the film, I think I can overlook them. At least I enjoy watching Spirited Away very much. Years may have passed, but this film is still interesting to watch. Spirited Away is remarkable, unusual, amazing, and exciting. It is funny, weird, and wonderful at the same time. This childhood film of mine is surely enjoyable to watch. 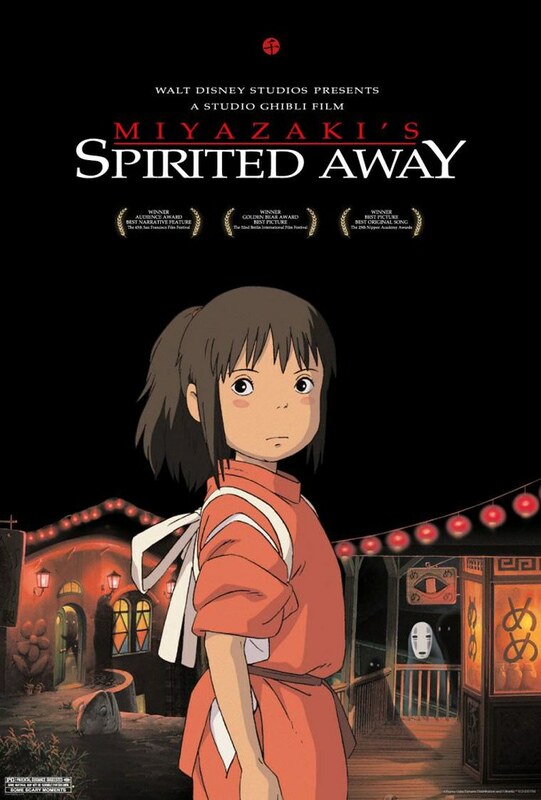 I give Spirited Away 8.5 out of 10 stars. What a great film this is ! From all the Ghibli films, this one is definitely my favourite. I agree with you about Haku. He is definitely the one many would like to know more about.